Spotted nutcrackers are named for their appearance and the way they use their large bills to take the shells off of nuts. There are white spots and streaks in their feathers. 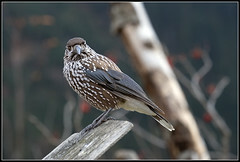 The spotted nutcracker’s brown body plumage is the color of chocolate. The lower part of the body is white. The wing and tail feathers are a shiny black. There are white tips at the ends of the wings and feathers. The spotted nutcracker’s bill, legs, and feet are black. Seeds hidden by spotted nutcrackers sometimes sprout into saplings that grow into trees. The spotted nutcracker’s habit of hiding food caused the growth of new Swiss pine trees in areas of the European Alps where people had cut down all the trees.